This groundbreaking article explores the relationship between geometry and theology. It should be considered an experiment in thinking and an exercise in speculation and classified as a mild form of mysticism. The views held by the author on the subject of geometric theology are tentative and subject to revision. The expression “God geometrizes” is attributed to Plato but it is not to be found in his writings. It is a quote from Plutarch (Convivialium disputationum, liber 8:2): “Plato says that God geometrizes continually.” In his writings Plato said that “the knowledge of which geometry aims is the knowledge of the eternal” (Resp, VII, 52). The entirety of nature provides compelling evidence that God geometrizes. Therefore, it is fitting that geometry be introduced into theology. Geometry is not purely mathematical. We have examples in nature of geometric shapes and patterns. For example, the six­sided (hexagonal) shape of snowflakes and the honeycomb cells in a beehive. The mineral quartz forms crystals that sometimes have the design of a six­sided prism with pyramid shaped ends. In fact, geometric designs are everywhere in nature and can even be found at the molecular level. For instance, six pairs of electrons separated in space form an octahedron (eight sides) with 90 degrees between all of the valence electrons. And when we observe the shape of a spiral shell, a starfish, or the wings of a butterfly, we have evidence that God geometrizes. He is the author of mathematics and the inventor of geometry. Geometry is the branch of mathematics that concerns itself with lines, angles, shapes, and space. For instance, the dimensions of the altar are described in scripture. Ezekiel wrote that “the altar shall be twelve cubits long by twelve broad, square in the four sides” (Ezk 43:16). The inspired scriptures talk about the “circle of the earth” and the “circle of the sky” and Ezekiel describes four living creatures who had wheels and a wheel within a wheel (Ezk 1:16). It could be describing something that works similar to a gyroscope: a spinning wheel in which the axle is free to assume any orientation. Some could object to the concept of geometric theology and claim that the Bible does not even mention geometry. But that is hardly the case. We read in scripture that God draws lines and measures objects. He convicts Job of his ignorance when he says “where were you when I laid the foundation of the earth, declare if you understand. Who has laid the measures thereof, if you know? Or who has stretched the line upon it” (Job 38:5). And Isaiah describes how the “carpenter stretches out his rule; he marks it out with a line; he fits it with planes; and he marks it out with a compass and makes it after the figure of a man” (Isa 44:13). The book of Revelation describes the New Jerusalem as a cube shaped structure. John wrote that “the city lies foursquare and the length is as large as the breadth: and he measured the city with a reed, twelve thousand furlongs. The length and the breadth, and the height are equal (Rev 21:16. Thus, John was inspired to describe the New Jerusalem in geometric terms. The Bible contains enough examples to convince me that geometry is part of scripture. The builders of the temple employed geometry in their work as evidenced by the shapes and sizes that are described. Because three dimensional objects such as the New Jerusalem are mentioned in scripture, I feel confident in using three dimensional objects such as polyhedrons to describe the geometric forms associated with names and numbers in the word of God. In terms of geometry the number of man can be best described as a hexagonal (six sided) pyramid which has one hexagonal, six triangles, twelve edges, and seven corners. The six sided hexagonal base represents the number of man and the six triangles remind us that Adam was created on the sixth day. The seven corners are six plus one because the seventh represents the vertex at the top of the pyramid where the six triangles converge. This adequately describes man working six days and then resting on the seventh. The 12 edges represent the twelve tribes of Israel who are major participants in the great cosmic drama. Also, the seven corners show that man can transcend his number (6) and partake of the divine nature (7). The seventh corner is the vertex which is the highest point of the pyramid. Men are destined to be the sons of God and will be given a new number. Whether the seven corners also represent a seven thousand year plan of God is left to speculation. We don’t know if the six thousand years are completed or when the first year of the millennium begins. For several reasons I have not included a geometrically designed Star of Man similar to the Star of David. Jesus said that it was not until sometime in the future that overcomers would be given the morning star (Rev 2:28) and have the name of God (Rev 3:12). He was referring to the seven letter sacred name Yahowah. Man is not destined to keep the number six or the hexagonal pyramid to permanently represent him. Perhaps when he becomes a son of God, he will be represented by a seven sided heptagonal pyramid whose eighth corner is the vertex. This would be fitting because eight is the number of Jesus who is the first to be brought to glory and the firstborn among many brethren. Thus, Jesus elevates man to a higher level of being. For years I have wondered why God chose the number seven. I don’t want to sound presumptuous but I think I have found the answer. The number four can be divided by two, the number six by two or three, and the number nine by three, but the number seven cannot be divided by any other prime number. In this context, the number seven is indivisible. And the fact that seven divided by one equals seven and seven divided by seven equals one reinforces the concept of indivisibility rather than nullifying it. Please keep in mind that the number one is not a prime number or a composite number and that every number can be divided by one or itself, therefore it is irrelevant to the discussion. God also selected seven because it has the highest value of the prime numbers between one and nine which are two, three, five, and seven. The theological message of number seven is simple and clear: God is one and therefore indivisible and has the highest and greatest value. It also tells us that his kingdom cannot be divided. He chose number seven because it resists division, maintains its oneness, and has the highest value. The prayer “Shema Yisrael” is considered the centerpiece of Jewish services. It is taken from the words of Moses in Dueteronomy 6:4: “Hear Oh Israel, Yahowah is our God, Yahowah is one”. This powerful message of God’s oneness resonates throughout the entire Bible and his choice of number seven reinforces this truth. God is one being of the utmost and highest value. Thus, even the math of the seven letter sacred name contains the profound message of oneness. In terms of geometry, the sacred name could best be described as a pentagonal pyramid. It includes all the numbers of the divine name (Y=10, A=1, H=5, 0=6, W=6, A=1, H=5). The pentagonal pyramid has ten edges, one pentagon, five triangles, six faces, six corners, one vertex (top), and a five sided base. Thus, the numbers of the pentagonal pyramid are identical to the numbers of sacred name. The number five in scripture references the five books of Moses, the five components of the temple incense, the five parts of the holy anointed oil, the five Levite offerings, and the fifth stone kingdom of the Messiah foretold in the book of Daniel. The regular pentagonal pyramid is one of the Johnson solids (J2) bounded by five equilateral triangles and one pentagon. The triangles meet at a point called the vertex (top of the pyramid) which is analogous to Yahowah’s position above all others. In spiritual terms it tells us that power and authority converge at one central point which is the throne of Yahowah. Thus, the pentagonal pyramid and its mathematical structure provide a geometric model of the sacred name and the kingdom of God. This serves to introduce readers to geometric theology which by definition means that spiritual truths are contained in geometric forms. The seven numbers of the pentagonal pyramid equal 34. Is there anything significant about this number other than the fact that it adds to seven? The surprising answer is that there are approximately 3400 years between the creation (4000 B.C.) and the captivity of Israel and Judah (604­-585 B.C.) which resulted in the destruction of the temple. It is a little known fact that the first word in the Bible is the letter “B” (with an added vowel “e”) and can be translated “in” or “when”. The second word “resit” (beginning) means first in time, order, place, and rank. The creation story begins with the letter beth (b) which means house. God likened his creation to the building of a house, heaven being the house of God and earth the house of man. Later the temple became the house of God on earth. It was 3400 years from the creation of the house of God in heaven to the destruction of the house of God on earth. Thus, the number 34 takes on important overtones. In terms of geometry, the Kingdom of Yahowah is like a pentagonal stone pyramid with five equilateral triangles converging at the vertex which symbolizes the central authority and highest power in the kingdom. The capstone symbolizes Yahowah and the chief corner stone represents Christ. It is significant that the number five is prominent in the measurement of various objects in the tabernacle. The Levites were instructed to make five curtains, five crossbars of wood, five sockets of brass, and an altar five cubits long and five cubits wide (Lev 26:9). And there are five Levitial offerings (Lev 7:37). Perhaps there is a connection between the five triangles of the pentagonal pyramid and objects in the tabernacle which involve the number five. I want to say a few words about the special connection between numbers five and seven. Both are prime numbers and cannot be divided by lesser prime numbers. Thus, the five sided pentagonal pyramid maintains the theme of God’s indivisibility. The reason I chose the pentagonal pyramid (five sides) rather than the heptagonal pyramid (seven sides) is because the numbers in the sacred name are a perfect match for the numbers in the pentagonal pyramid. In fact the match is uncanny and presents a perfect mystery. It is worth noting the connection between the number seven, the twenty­two letters of the Hebrew alphabet, and the geometry of a circle. Recall that the sacred name has seven letters, one of which is a circle (the vowel o) in the exact center. An important constant in geometry is called pi. It represents the ratio between the circumference and the diameter of a circle. When you divide the 22 letters of the Hebrew alphabet by the seven letters of the sacred name, you arrive at the value of pi which is 3.14. The circumference of a circle is equal to the value of pi (3.14) multiplied by the diameter. Note that fractions such as 22/7 are used to approximate pi. Thus, this mathematical constant can be linked to the sacred name. Also keep in mind that the four numbers of the sacred name (Y=10, A=1, H=5, W=6) equal 22 and when divided by 7 equal 3.14 (pi). Shall we call this a divine coincidence or a planned connection? The theological message of the circle which has a center point is that God is one and the central authority in the universe. The fact that a circle (the vowel o) is in the exact middle of the divine name emphasizes the message of oneness and central government. Thus, the sacred name contains mathematical messages that have theological significance. The story of pi doesn’t end yet. The peculiarity of the value of pi is that it cannot be precisely computed because it has an infinite number of digits and no endpoint. It has been calculated to more than ten trillion digits but no end point was found. As mentioned earlier, when we take the number of letters in the sacred name (7) and divide it into the total value of the four numbers in the sacred name (22) we have the value of pi (3.14). The fact that pi cannot be precisely determined has the theological message that God cannot be precisely defined. Seeing God as an all-encompassing and ever expanding circle whose dimensions can never be precisely measured provides an open ended and always incomplete approximation of divinity similar to the value of pi. The digital numbers of pi are infinite and carry a theological message about the infinite mind of God. For those who have become even more curious about the mathematical constant known as pi and its possible relationship with scripture, I will mention that the biblical approximation of pi is found in I kings 7:23 and 2 Chronicles 4:2. The circular molten sea has a diameter of ten cubits and a circumference of thirty cubits which gives pi the approximate value of 3. Perhaps that was sufficient for the builders or the added width of the rim brings it closer to the actual value of pi. The fact that the molten sea is a cylindrical object shows that the tabernacle did contain a circular structure which could have been calculated using a rough approximation of pi. We know from Genesis 1:14­19 that the sun was created to rule the day and the moon was created to rule the night. Both are circular objects. Scripture also mentions “the circle of the earth” which most likely refers to the visible circle of the earth which can be seen from a mountain or high building that provides a view in all directions. In reference to Yahowah, Isaiah wrote: “It is he that is enthroned about the circle of the earth; it inhabitants are like grasshopper, He stretches out the heavens like a thin cloth and spreads them out like a tent to live in” (Isa 40:22). This verse could imply that the earth is circular but we cannot be certain of that interpretation. Job mentions that God “walks on the circle of the sky” (Job 22:14) which most likely refers to the circle or dome of the sky. Job could be saying that God walks on or above this dome. At this point I want to interject a note regarding the rainbow. Even though counting the number of colors in a rainbow could be considered somewhat arbitrary it has been generally accepted that this visually stunning circular object has seven colors (red, orange, yellow, green, blue, indigo, violet). While the rainbow is a full circle, the reason we don’t see it entirely is because the earth partially blocks our vision. The beauty of the rainbow and its seven colors are connected with the seven letters of the sacred name. After the catastrophic flood, God provided a sign that he would never again destroy the earth by water. His choice of the seven colored rainbow marks the covenant he made with Noah and connects his special number seven with this permanent agreement. Seven is God's mark of distinction and seal of identity. In other words, God’s spiritual signature is the number seven. His special love for light and sound is reflected in the seven colors of the rainbow and the seven notes of the musical scale. Thus, we see God’s signature in nature and scripture. Seven truly is a mysterious and supernatural number. From number eight, the number of Jesus, we can form an octahedron which has eight equilateral triangles. It looks like two square pyramids joined at their base and has six corners and twelve edges. The numbers six, eight, and twelve figure prominently in the life of Christ. Jesus chose twelve apostles and was resurrected on the eighth day. And the number six (the number of man) is appropriate because he called himself the son of man. In a negative sense, the number three plays a powerful role in the drama of the crucifixion. This number is stressed in the octahedron because each of the eight triangles has three equal angles and sides. Jesus was crucified in the third hour, spent three days in the grave, and was betrayed by Peter three times. Thus, the octahedron is descriptive of the prophetic events in his life. The two pyramids linked at their base symbolize the human and divine nature of Christ. The aesthetic beauty and exquisite symmetry of the octahedron has made it a favorite subject of geometers since the days of ancient Greece. The expression “two pyramids linked at their base” needs qualification. In this octahedron neither pyramid has a base. They simple look like two pyramids joined at their base. By contrast the pentagonal pyramid associated with the Father has a solid five sided base. This brings out an important theological point. Jesus has no base in and of himself. His base or foundation is in the Father. Christ said “I can of my own self do nothing (Jn 5:30). The numbers in the octahedron add to 31. Does that number have any significance in the unfolding drama of salvation? The Bible is full of secrets and here is another one. There are approximately 3100 years between the death of Adam at age 930 (3070 B.C.) and the death of Christ (30 A.D.). The first Adam has the number 3 (930=12=3) and the last Adam (Christ) has the number 3 in the events of their life. Also, the number 31 equals 4 and is the value of the fourth Hebrew letter daleth (d) which means door. And if you recall that Jesus said “I am the door” (John 10:9) the connection becomes obvious. The Bible predicted that “there shall come a star out of Jacob” (Num 24:17) and while it refers to David it preeminently denotes the Messiah. The reason that we can associate Jesus with a star is because in the book of Revelation he calls himself “the bright and morning star (Rev 22:16). And the three wise men followed a star to the city of Jerusalem and said “where is he that is born of the Jews for we have seen his star in the east and are come to worship him” (Mat 2:2). Thus, they followed a specific star which led them to Bethlehem. It would be appropriate to draw the Star of Jesus with eight points because eight is his number and the octahedron has eight triangles. I have deliberately refrained from using the figure of a star to symbolize Yahowah because he created the stars and his throne is above the stars. Angels are called stars and Jesus is the bright and morning star but the Father is never referred to as such. Therefore, I think it would be inappropriate to represent God as a seven pointed star. The three dimensional form of the number nine is a nonahedron. Keep in mind that the term nonahedron is somewhat ambiguous. It can also refer to the octagonal pyramid, elongated square pyramid, elongated triangular dipyramid etc. The nonahedron that I have chosen to represent Satan is constructed from six irregular pentagons and three rhombi, making it a rather distorted geometrical form. The gaps between the pentagons are filled in with rhombi. These four sided rhombi look like a leaning square. The geometric combination of irregular pentagons and rhombi symbolizes the perverse character and distorted nature of Satan. Jesus described the Devil as a liar and murderer who did not abide in the truth (John 8:44). In the pentagonal pyramid which represents the numbers in the sacred name Yahowah the one pentagon has equal sides and equal angles, but the six pentagons in Satan’s nonahedron are unequal, thus irregular. The three rhombi symbolize the role that Satan played in the death of Christ. I have already mentioned the significance of the number three in the events surrounding the crucifixion. Even the thirty pieces of silver paid to Judas is a multiple of three. The six irregular pentagons reveal the affiliation between Satan and the beast. The number 666 when added equals nine the number of Satan. And we know that the serpent in the Garden of Eden was created on the sixth day. Thus, the negative manifestation of the numbers 3, 6, and 9 are evident in the life and activities of Satan. The number nine is associated with Osiris the Egyptian god of the dead who rules the underworld and has 36 forms. Egyptian astrologers divided the zodiac and the human body into 36 parts, each of which were controlled by a different demon. Thus, the number nine (36=3+6=9) manifests its negative energy in Osiris the god of the underworld who represents Satan. Also note that the Chinese dragon has nine forms, nine attributes, and nine children. The body of the dragon has 117 scales, 81 yang (masculine) and 36 yin (feminine). Notice that all three numbers are multiples of nine. It is interesting to note that man divided the circle into 360 degrees which has a diameter of 180 degrees and is further divided into 90 and 45 degrees. What these numbers have in common is that they are multiples of nine. Perhaps there is a connection between Satan being the god of this world and man dividing the circle of the earth into multiples of nine. By contrast the Bible divides the earth into four quarters and the New Jerusalem has four equal sides. God’s number of organization is four or twelve, not nine. He had three tribes position in each of the four directions or corners of the earth and the New Jerusalem has twelve gates. That is not to say that there are no positive uses of the number nine in the Bible. Numbers are neutral and can indicate good or evil things. Recall that when Abram turned ninety­nine years of age, God renewed their covenant. The six irregular pentagons in the geometry of Satan can be contrasted with the one regular pentagon in the geometric numbers of God. While the prophecy in Isaiah regarding the King of Babylon is primarily focused on the physical king, many commentators have suggested that it contains allusions to Satan. When Jesus said that he “beheld Satan as lightening fall from heaven” (Luke 10:18) he could have been alluding to what God said about the king of Babylon: “How art thou fallen from heaven, O Lucifer, son of the morning. How art thou cut down to the ground., which did weaken the nations. For thou hast said in thine heart, I will ascend into heaven. I will exalt myself above the stars of God. I will sit also upon the mount of the congregation, on the sides of the north. I will ascend above the heights of the clouds; I will be like the most high” (Isa 14:12­14). We know from the book of Jude that the angels left their first estate (Jude 1:6). And John tells us that the dragon’s tail “drew a third part of the stars and did cast them to earth” (Rev 12:4) which could be a reference to the angels who rebelled with Satan. The six irregular pentagons in the structure of Satan’s nonahedron and its similarity to the one regular pentagon in the numbers of God’s name indicate that Satan wanted to be like the most high and ascend the throne but was defeated and cast down to earth. Both Satan and the whore of revelation 17 are pretenders who falsely appropriate the numbers of God. The dragon has “seven heads, ten horns, and seven crowns” (Rev 12:3) and the whore has “seven heads and ten horns” (Rev 17:3). Thus, it comes as no surprise that Satan with his six irregular pentagons would want to be like God who has one regular pentagon in the geometry of his numbers. It is worth noting that Jesus and the Father have prominent equilateral triangles in their geometric configurations. Christ legitimately aspired to be like his Father in heaven and was richly rewarded for his obedience. He is now the exalted son of God who has been given the name of Yahowah. What I find so strange about the number nine is that no matter how many times it is multiplied the result is always nine. And the whole numbers taken together as the number 123,456,789 and multiplied by 81 (9x9) equals 999,999,999 which has nine numbers and adds to nine. Thus, the last whole number (9) perpetuates itself through multiplication. Jesus said that his enemies were the children of Satan and that the Devil was the father of lies (Jn 8:44). Perhaps the message from the negative manifestation of the number nine is that Satan perpetuates his influence through lies. His multiple and perpetual lies make him the father of deception. Mathematicians and geometers might inquire as to why I chose the nonahedron rather than the nonagonal pyramid as the geometric symbol for Satan. When God created this angel of light in all his beauty and splendor the symbol of a nonagonal pyramid would have been appropriate but after he rebelled and was cast down from heaven his distorted mind appears to fit the geometry of a nonahedron which, as I mentioned before, consists of irregular pentagons and square rhombi in a rather distorted nine sided form. However, in the light bringer’s original state the nonagonal pyramid with its nine beautiful triangles would have been a perfect geometric description. Ezekiel’s lament against the king of Tyre could be another allusion to Satan. He wrote: “You who seals up the measure of perfection , full of wisdom and perfect in beauty. You have been in Eden, the garden of God. Every precious stone was your covering, the carnelian, chrysolite, and amethyst; beryl, lapis lazuli, and jasper, sapphire, turquoise, and emerald; and gold of which your flutes and tambourines are made and prepared on the day that you were created” (Ezk 28:13). Commentators generally agree that nine precious stones are mentioned. The gold pertains to the flutes and tambourines and was not used as a covering. These stones are nine of the twelve on the breastplate of the high priest (Ex 28:17) and gold is not one of them. Nine the number of Satan reappears in this prophecy against the king of Tyre. Ezekiel further identifies this person as “the anointed cherub that covers with outstretched wings; you were on the holy mountain of Elohim; you walked among the stones of fire; you were perfect in your ways from the day that you were created, until iniquity was found in you” (v. 14). It is difficult to believe that these comments pertain solely to the king of Tyre. The reference to him being the anointed cherub brings to mind the two cherubim on either side of the arc of the covenant which was in the tabernacle and more specifically in the holy of holies. Apparently Satan was once a perfect creation and held a position that might have been at the left hand of God. His desire to be like God was the catalyst for his failed attempt to overthrow Yahowah. Geometrically speaking, the six irregular pentagons in Satan’s nonahedron are in conflict with God’s one regular pentagon. 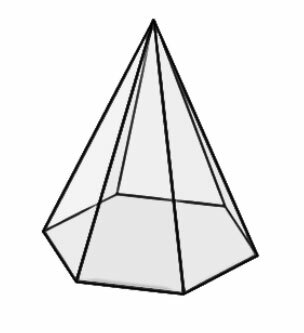 By way of contrast, when you compare Christ’s octahedron with the Father’s pentagonal pyramid it becomes apparent that no conflict exists. They both have equilateral triangles and no irregular pentagons. Thus, from a geometric point of view, Jesus is perfectly compatible with his Father and the symmetry of their triangles provides the evidence. The beauty of the equilateral triangle is found in its three lines of symmetry, one through its center and one through the middle of each side. In addition, the altitudes, angle bisectors, perpendicular bisectors, and medians coincide. The positive manifestation of the equilateral triangle is in the unity of the Father, Son, and Holy Spirit. Recall that the Father is symbolized by a pentagon in the geometric configuration known as a pentagonal pyramid and the number five appears twice in his sacred name. Christians adopted the pentagon and made it a symbol of Jesus. The five points of the pentagon represent the five piercings of Christ (two hands, two feet, and one spear thrust in his side). I would be negligent if I failed to mention that another geometrical object known as a two dimensional irregular nonagon (9 sides) has interior angles that add up to 1260 which is the number of days the two witnesses prophecy in sackcloth before they are killed by the beast (666=18=9) who ascends out of the bottomless pit. Therefore, this nine­sided irregular nonagon could symbolize the work of Satan and the beast. I am certain to be asked the question: If nine is a negative number, why are there nine gifts of the Holy Spirit? Before I answer that question I remind readers that there are seven fruits of the Holy Spirit, not nine (Gal 5:22). But it appears that there are nine gifts of the Spirit. However, readers might have overlooked the fact that the tenth gift is the Holy Spirit itself which is more important than the additional gifts. Having said that let me repeat that numbers can symbolize positive or negative aspects, so no number is intrinsically evil. Even the number seven can signify the negative consequences of disobedience. God promised to punish Israel seven times if they refused to keep the law (Lev 26:28). And there are seven last plagues mentioned in the book of Revelation (Rev 21:9). Even the number three which in scripture is predominantly negative has a positive manifestation in the unity of the Father, Son, and Holy Spirit. And the triangle with three sides and three angles is found five times in the geometry of the sacred name and eight times in the geometry of Christ’s number. Now regarding number nine: If you were born on the ninth day of the month don’t panic and think that you are cursed with an evil number. God created the number nine and therefore it is good. We need not become superstitious about numbers. Geometric theology reveals the mathematical master plan of salvation and the incredible connections that exist in the oneness of God. Even the simple element of salt has a geometric message. Jesus said that Christians are the salt of the earth (Mat 5:13) and we know that the beauty of salt is in the cubic crystals that it forms. Christians are like salt crystals that adorn the earth. And the connection between salt crystals and the New Jerusalem lies in the fact that both are cubic. Also the architecture of the sacred city has eight vertices which are the places where three or more edges meet. This connects the New Jerusalem with the number of Jesus (8). Thus, it can truly be said that everything is linked to the master plan of salvation and all geometric lines lead to God. We have learned that spiritual truths are being revealed in the language of vertices, edges, and faces that represent the mathematical and geometric structure of objects. The pentagonal pyramid that reflects the numbers in the sacred name is perfect in every respect. Both the pentagonal base and the five triangles have equal sides and angles. Truly the symmetry in this elegant pyramid is breathtaking. And the octrahedron associated with the number of Jesus has eight beautiful and symmetrical triangles that are like prophecies written in geometric form. In conclusion, the theology of geometry that I have introduced could become a new field of study. If theologians can discuss semiotics and thematics in hermeneutics, then geometric theology should come as a welcomed relief and be granted a place at the table. The universe is a geometric masterpiece and its secrets are hidden in the designs of a crystal and in the lines of a pentagonal pyramid. We cannot deny the simple fact that God geometrizes and leaves his signature in the delicate designs of a butterfly and in the exquisite beauty of an octahedron. Thus, I have laid the foundation of geometric theology and others can build upon this structure. This short chapter only scratches the surface of the subject. I leave it to other minds greater than mine and more adept at mathematics and geometry to continue the pursuit of a solid geometric theology.